Description: This CVA was imported early in their business, and only for a short time. The 24" heavy octagonal barrel has good/fair rifled bore with some frosting, and sparse corrosion down in the grooves, but good enough to shoot. The action works good, and has one trigger. 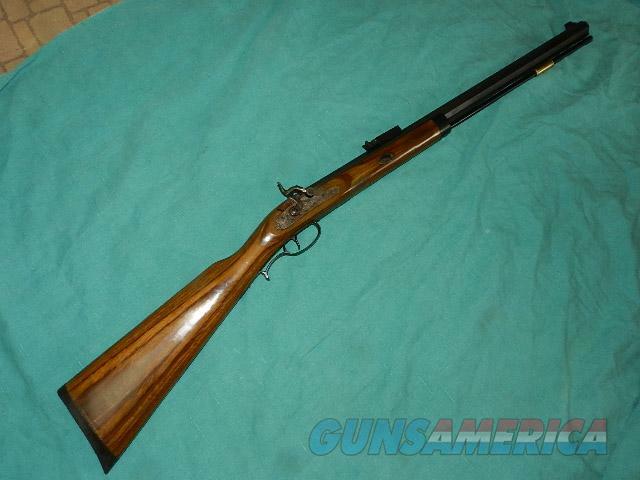 The America composite hardwood stock is good with a few handling dings, and has a black nose cap., and one barrel wedge. The metal is full blue but weakened along the top of the barrel where there is evidence of mild frost and possible blue touch-up. Has good front and rear sights!Ramrod is fiberglass, with a brass tip. This is a kicker with .54 cal! We don’t have a web site .I prefer money orders or a check. Item ships when funds come in. If you can only pay with a card let me know. I hope you like my wide selection of unusual guns, knives and gun parts. Shipping price determined by zip code. I try to keep the prices affordable, which means I make less money than most dealers. You won’t get altitude sickness with my prices! I consistently have the best selection of older guns If you BUY IT NOW you must still contact us for details buy it now doesn't end the sale, it just sends an email telling us you want to buy this gun. A phone call won’t secure a sale! Not home many times, the first buyer by email buys the gun !This web site doesnot close down a sale when you do a BUY IT NOW like Ebay!I can get six buy it nows in an hour, first buyer to email gets the guns, others are in second place! Best to send another email . Sometimes not home to get calls. Some guns are required shipment to a gun dealer near you for a transfer to you when it arrives. With the widest selection of older guns at great prices, We don’t have a store, and sell on the internet only.